When you walk through darkness, how will you find your way? Images from the drowning accident at the beach continue to haunt Lily, the new girl at Meadowcreek high school. She finds herself caught in a struggle between two handsome boys who have moved to Meadowcreek with one purpose. Now with their paths crossed, Lily's life will never be the same...because her destiny now lies in their hands. My feelings on Eyes from Heaven are little back and forth. There are some elements of this book that I really liked and then some that I didn't like so I really had to give it three out of five stars. I really liked the overall concept of the novel, but I didn't really like that it was a story that was a mirror of another story inside of the story. I know that sounds really confusing so I will try to clear it up. In the book Eyes from Heaven Vincent tells the main character, Lily, a story about two angels named Ariel and Xaphan who both fall in love with a girl named Alexandra. In Eyes from Heaven there are two boys, Vincent and Marcus, who are after Lily's heart. Now, that that is cleared up what ends up happening in Eyes from Heaven is that the stories of Ariel, Xaphan, and Alexandra mirror the story of Marcus, Vincent, and Lily. I didn't like that. I like the overall story of Marcus, Vincent, and Lily, but I wish that it didn't mirror another group of characters stories. I wish that the past of Ariel and Xaphan never existed in this story at all, because it would have made the story much more real. By including the story about the angels from the past it makes the reader constantly try and figure out if Vincent IS Ariel or if they are two different people. It just makes for a muddy, confusing story and it could have been made simpler. If you take out the back story of the angels (Ariel and Xaphan) I really liked the story, but since the back story is in there, I had issues. As for the characters it was mixed signals again. I like Vincent, but I don't like how other worldly he is. He fits in pretty well, but at the same time he is very much an outsider. I wish there would have been a much more smoother transition of Vincent's character to make him seem more Human. Lily was a pretty overall great main character, but I don't like how submissive and ignorant to the facts she is. She lets all the other characters around her push her around and make decisions for her instead of making them for herself. And when she starts noticing things about Vincent she just keeps sweeping them under the rug instead of trying to figure out the truth. I just wanted to reach in and snap my fingers in front of her face to make her wake up and see what was going on around her. There was one character that I truly hated and that was Lily's mom. I really wanted her mom to end up having a breakdown and snap out of her narcissistic ways. She drove me crazy throughout the entire book, because she never woke up and realized how she was treating her daughter. 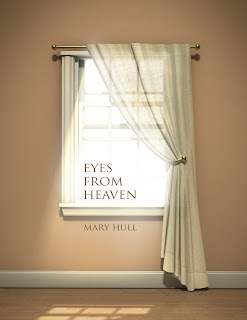 I really feel that with the right editing and publishing team that Mary Hull could make Eyes from Heaven go from being an alright book to a great one. It really just needs some more re-working and it will be a hit. I feel that Eyes from Heaven was an alright novel. I had some issues with the story line being a mirror image to the fairy tale that is told to the main character. I also had some small issues with the characters that made me not fully connect with them. I think this book has great potential to be a very good read if it gets re-worked a little.